Welcome back Indy Reds! 2014 comes to a close today and my oh my what a year it has been! In January of 2014 our little adventure was about 3 months old, we finally got a Facebook page set up & LFC started that amazing 2nd half of the season that few will forget. 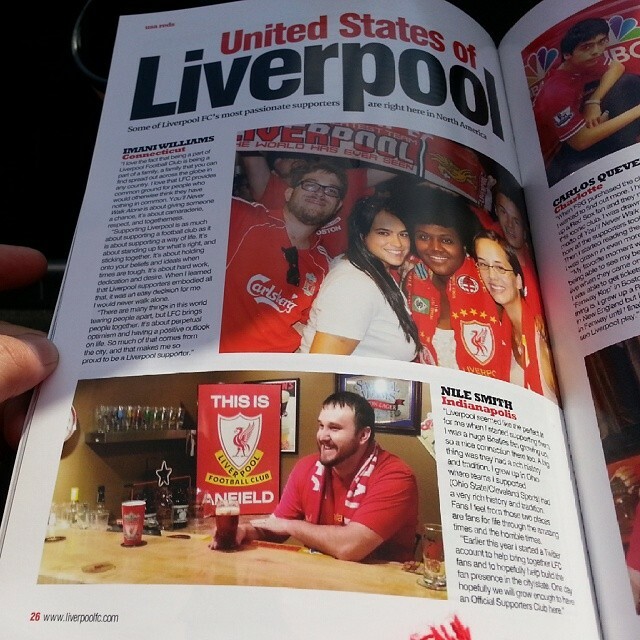 As LFC continued the build up to Chicago, one of our Indy Reds Nile Smith was lucky enough to be interviewed by the club and be featured on their new website promoting the USA tour. You can check it out here if you haven’t seen it yet. The weather started to break and spring was upon us, LFC was playing some of the most exciting soccer that majority of us have ever witnessed and for the 1st time a lot of us had the chance to root on a local soccer team and holy moly did this city get behind them. Indy Eleven started their inaugural season and both Indy Reds and soccer lovers overall flooded “The Mike” Michael A Carroll stadium on the campus of IUPUI. It gave a lot of folks the chance to feel some pride in their city and it was a great fellowship chance to get Indy Reds together. That is from one of the tailgates in Early May before an Indy Eleven match. Lots off good beer was drank. Some tasty tamales(thanks Jim) Some delicious Crostini(thanks to the Italian man that is Lou) and also for some their first taste of Stadium Mustard. The “Boys in Blue” wouldn’t get the victory that evening but it was a joy to watch them during their opening season. These two were a huge part of the fun and excitement of the season. This was one of my favorite pictures taken during the year. SAS. Once July started the madness/excitement/growth really took off. 1st we changed our logo up. Big fan of both designs. Also in July on the ramp up to LFC coming to Chicago we started this site. It has had its ups and downs. The Indy Red Fan Focus features we do have been a massive hit and people are loving those. Our short lived Red Tardis series went well. Tricky to update the site and stay current but we are trying. End of July finally came around and what an experience it was. I(Nile) was lucky enough to be invited by the Chicago Supporters Club to come and watch training the day before the match. Seeing the team practice up close was amazing. It was wild how quick and fast the players are and the things they can do with the ball at their feet. 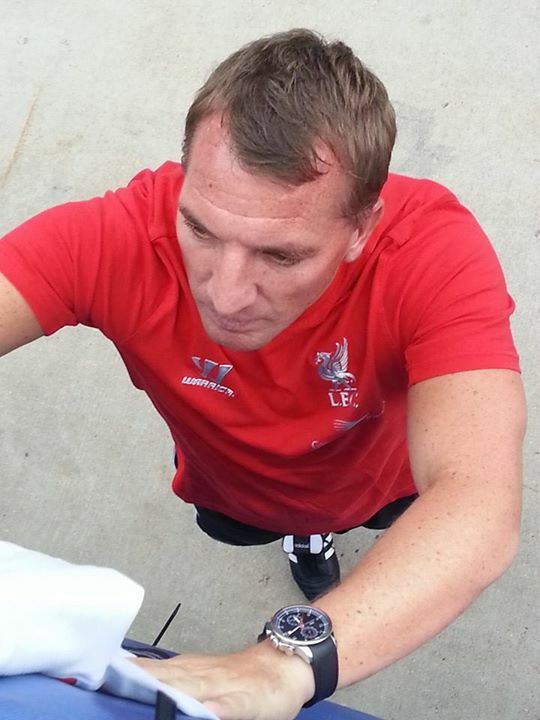 After training Brendan Rodgers was top class and walked the entire length of the field and met and greeted and signed things for everyone. Finally Matchday came. LFC would debut their new 3rd kit today. You’ll Never Walk Alone was belted out by everyone in the stadium. LFC got the win, songs were sung, beers were drank, It was a good day. It was nice during halftime some of the Indy Reds who were at the game got together for a group picture. During that halftime group picture someone mentioned that I should check out the matchday program. Let the geek mode kick in. Never would of imagined that would happen. During the month of July and then right after the match in Chicago we saw one of if not our single biggest jump in followers/memberships/likes etc. After the match in Chicago it seemed like a real possibility that we had a real good chance of hitting the numbers we needed to apply to become an Official Supporters Club. 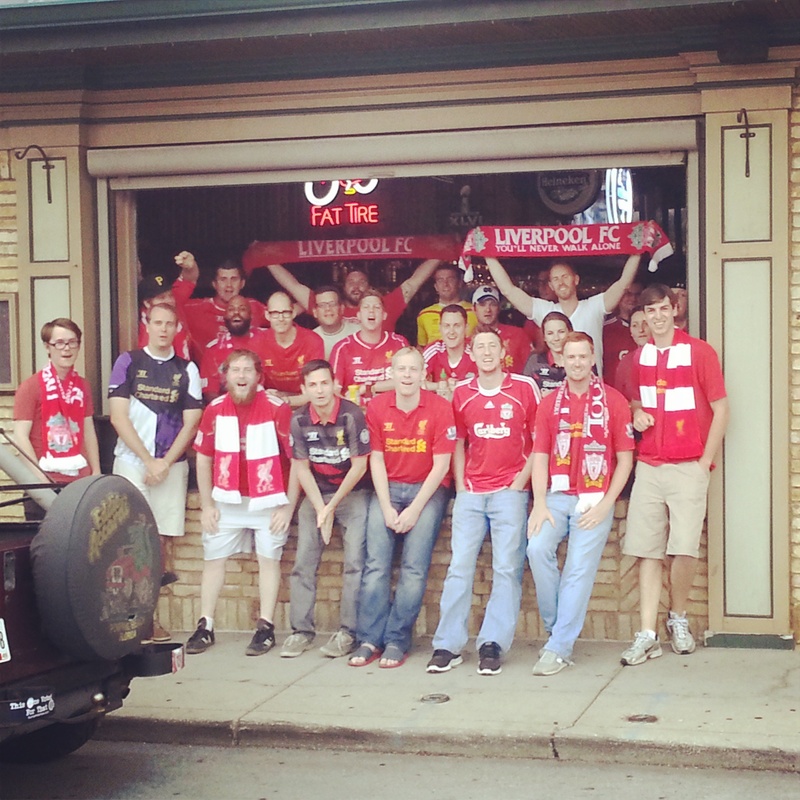 The Indy Reds were ready for another great LFC season. LFC didn’t have the best of starts, injuries and new players came with some rocky times for the first half of the season, but there were some bright spots. As the latter part of the year rolled around we had some amazing news come in. After barely a year in existence we were invited by LFC to become part of the family and become an Official Liverpool Supporters Club. 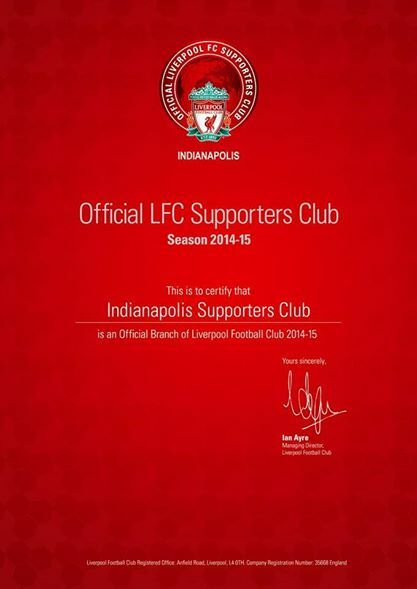 Very Proud and happy moment for not just me but for all of the Indy Reds. Lots of hard work and word of mouth/tweets built up our following. We now are on the website. It is still sinking in even a month later that we did it and we are part of that select group. As the year comes to a close we are still growing our Indy Red fanbase and getting more exposure. We’ve had two Indy Reds be featured on LFC TV post match show interviews. We are still having great crowds show up at Union Jack for matches. T-shirts and scarves are in the works. 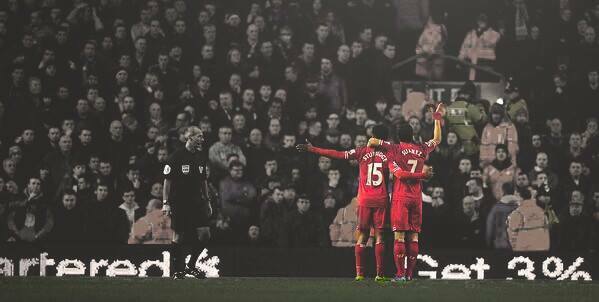 LFC over the last few matches has turned it around and are starting to play much better and the way we expected. 2015 is looking like it will shape into a great year. But WOW, very thankful and amazed at how much we’ve grown in one single year. We are nearing 1,000 followers on Twitter which is mind blowing to me. A big thank you to all of you Indy Reds who throughout the year came out to matches and events and communicated on Twitter/Facebook/Here. 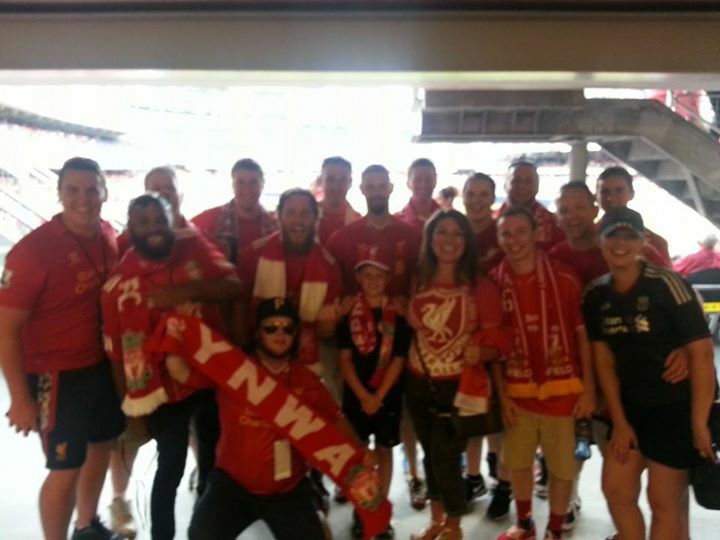 You helped to grow this group and get the word out that there are LFC fans in the city and we have a great group to be a part of. LFC play on New Years Day 10am kickoff v Leicester. Lets kick the year off with 3 points and make that push for 4th place. For as “bad” as we’ve been for the first half of this new season we really aren’t in that bad of a place. 5 points off 4th place. Semi finals for the League Cup. Chance to move on in the FA Cup, knockout rounds of the Europa League. So things are looking brighter. This entry was posted in Uncategorized and tagged 2014, Chicago, Fan Focus, Indianapolis, Indy, Indy Eleven, Indy Reds, LFC, LFCTV, Liverpool, New Years, New Years Eve, YNWA on December 31, 2014 by LFCIndy. Back from Break. Fan Focus. Welcome back Indy Reds! It’s been a while I apologize. Between having the international break and our Chairman Nile having a new baby the site got neglected some by not having anything posted in awhile. 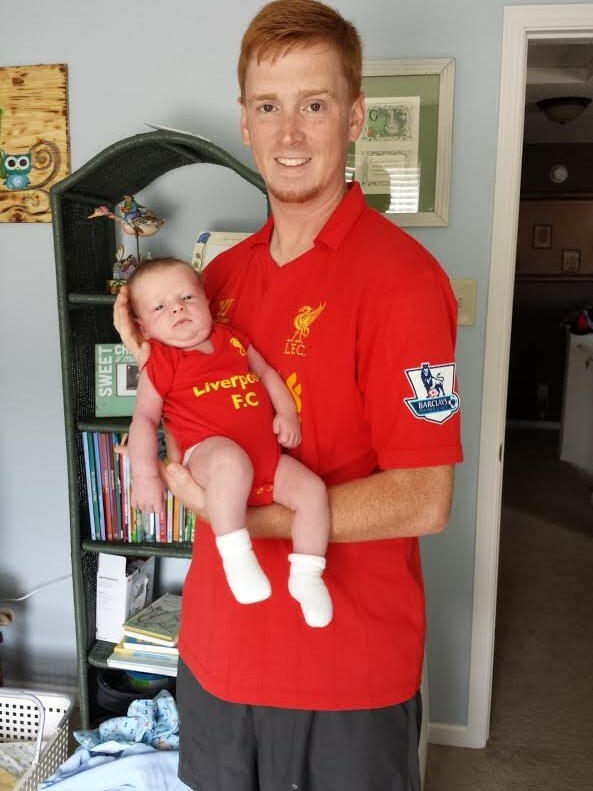 Well we are back with some team and Supporters club news but first a new Fan Focus with Indy Red and Southsider Kyle. How did you pick Liverpool as your team? A good friend of mine was studying abroad throughout Europe in 2004. Upon his return he gave each of us, his friends a gift from his travels. He knew that I played soccer in high school, so when I reached out he put a bright red L.F.C. scarf in my hand. Ever since then I’ve been a Red! Favorite LFC memory? I’ll skip the obvious and go with Dirk Kuyt’s hat trick against man u (I never capitalize theirs or chelsea’s names). I was up and running around the house yelling for that one! Do you have any superstitions or traditions you do/have for each match? No real superstitions… A couple traditions would be of course to wear Red on match day, and I always pull up Gerry and The Peacemakers ‘YNWA’ on my phone pre-match. Where were you during Istanbul? This is how I REALLY fell in love with L.F.C. I was still learning all about the EPL and all the other competitions involved throughout a season. Side note, I went into this venture completely alone. None of my friends or family were soccer fans. So there was much to learn. I had no clue about the match, but luckily I did happen to play hooky from work that day. I was just carrying on about my day off. I was bored flipping through channels when I stopped on ESPN2 (because I had seen it was Liverpool that playing). Just in time too. Caught the greatest game ever played! Favorite Current Player and Why? 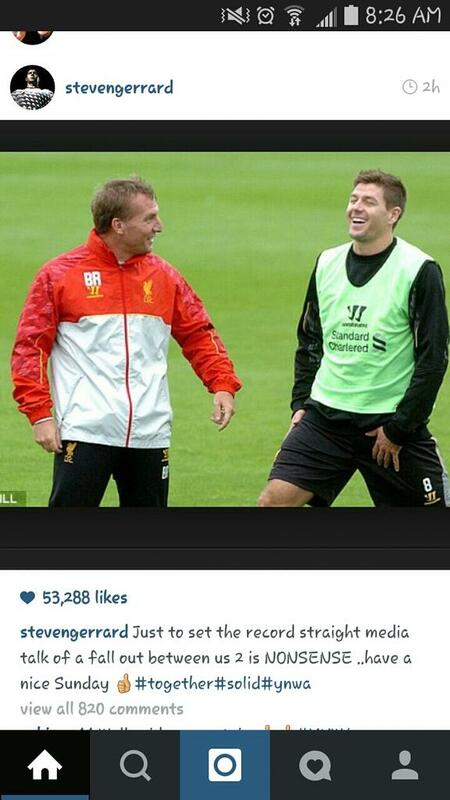 Stevie G! His work rate is second to none, and he embodies everything it means to be a great captain for a legendary team like L.F.C. If you could meet or have dinner with any LFC player/manager ever who it would it be & why? 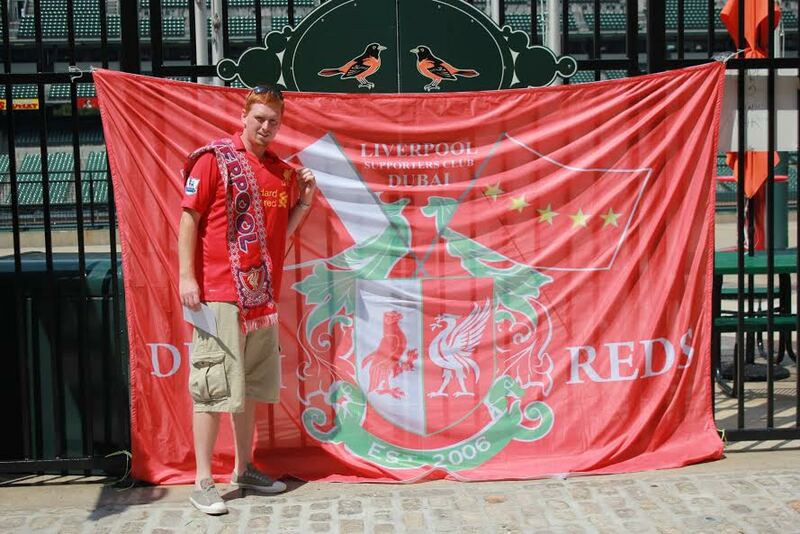 I’ve always looked up to Dirk Kuyt. I think he would be rather fun to hang out with and talk LFC over a few drinks. Favorite LFC kit ever? I’m really partial to the first kit I ever bought. The home 2010-11 Adidas kit. You are Owner of Liverpool for 1 day what do you do? I would most definitely go back to Adidas on being our kit provider! 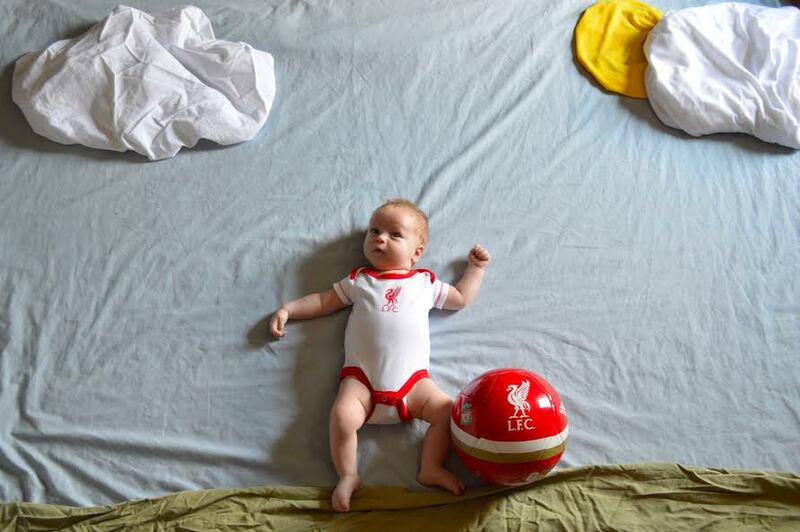 Oh oh and I would sign my 15 month old son to the academy! Where do you go to get your LFC news/info? When I’m on Facebook I of course look to LFC Indy. Along with LiverpoolFC, This is Anfield, and Empire of the Kop. I also check in with the Bleacher Report app. LFC have just won the league, where are you going for a celebration dinner in Indy Area? 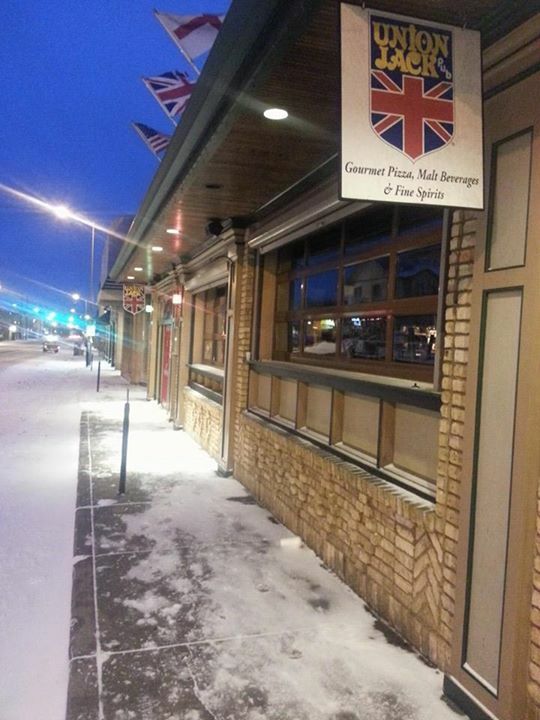 I would for sure be at UJ’s with all the other Indy Reds singing and drinking the afternoon….and night away. Newest Signing or Young Player you are looking forward to seeing this year play? We signed him this year, but he won’t be in Liverpool red until next season. I’m very excited to watch another young gun Divock Origi play as a red. Favorite LFC Goal? There are many of them, but for the sake of being different I would say when Suarez caught the Norwich keeper out from goal and booted a 40 yarder for his 4th goal of the night. Have you ever seen LFC play in person? I have. My little brother and I drove out to Baltimore a few years back to catch the Reds take on Spurs. I kept telling my brother to keep an eye on that very young Sterling player. He’s like a bolt of lightning! What other sports do you follow or hobbies do you have? I follow all the teams here in Indy. The Eleven, Pacers, Colts, Indians and soon the new hockey team, ‘Indy Fuel’. I also enjoy getting out and playing disc golf. Many great courses here in the Midwest! Best Local Indy Area Beer to have during an LFC match? We’ll just say my drink(s) of choice are Miller High Life w/ a shot of Beam on the side. Don’t judge me! What makes you most proud to support LFC? The level of passion from Liverpool supporters is unmatched. Win, Lose or Draw! Best thing about being an Indy Red? Being able to experience it all with other like minded Hoosiers! I used to feel pretty lonely down here in Franklin being a soccer fan in general, but I must say its slowly but surely improving. It was great to get 3 points on Saturday and what a way to grab them. I still shake my head and laugh a little when I say it: Glen Johnson with a diving header to win the match. He took a cleat/boot to the head too. Was nice to see us keep a clean sheet and Mignolet make some nice saves. We had a much better second half attacking which was great to see. Hopefully it will carry over into these next few matches. Last time I will mention it because I’m sure most have seen it but; Jane who is the liaison between the Supporters Clubs and LFC contacted us on Friday to invite us to be on the post match show on LFC TV. 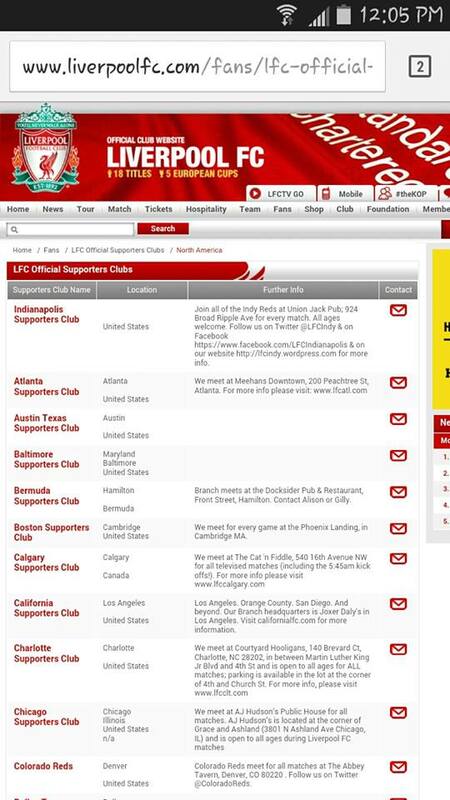 I was surprised/amazed/thankful that they thought of us out of all of the supporters clubs they could have picked from in America. It was a great chance to get some more exposure for OLSC Indianapolis and was a thrill to be on the show for the short 6 minutes. Glad I could get a small laugh in there with mentioning that I have met Claire Rourke before(very briefly in Chicago during the training session) and happy thousands of ears got to hear “Indy Reds” and “Official Supporters Club from Indianapolis” . If you haven’t seen the video yet here is a link to it on our Facebook page. Still only 5 points off of 4th place which is remarkable for how the year is going. So we are still in good striking distance to jump up there. We’ve got a favorable next two matches v Leicester on Tuesday and then Sunderland on Saturday. So hopefully 6 points there to boost the confidence more then take down Basel on the 9th to advance in the Champions League, then we have those bum mancs on the 14th. If you have LFCTV membership here is the pre-Leicester press conference. 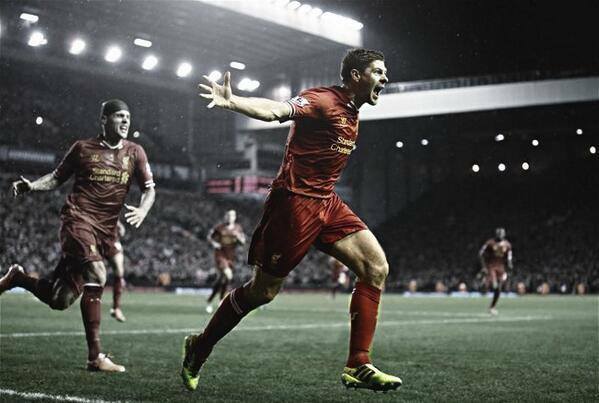 Steven Gerrard has been offered a new 1 year contract. Stevie hasn’t accepted or declined it yet. Rodgers said it is fine if he takes his time. Glen Johnson still has not been offered a new contract and not looking likely that he will be offered one. Sakho returned to training but won’t be fit for the match tomorrow could possibly be ready for the weekend. 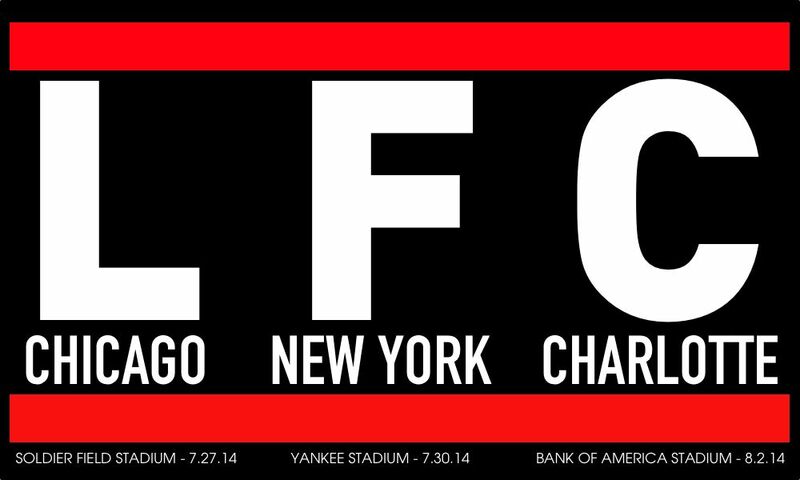 We are still waiting to hear from LFC about the trademark and logo revisions they are doing. Once we here everything is good to go we will get on ordering scarves. 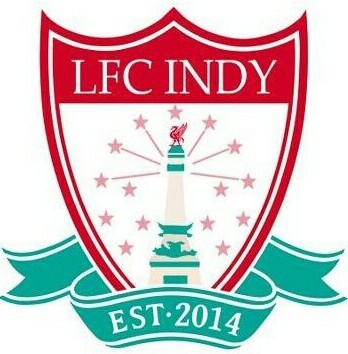 Unless they approve everything within the next week most likely won’t have them until start of the year(late Christmas gift for yourself and friends/family) We are also in the process of looking at getting window/car decals made with our logo but instead of “LFC Indy” on the bottom it would say “Indy Reds” Would you folks be interested in these if we decided to get them? Our Annual General Meeting still won’t be for a little bit, shooting for spring time April/May to do that to vote on board members(Chairman, Secretary, Treasurer) and go over the past year and get ideas for the upcoming year(events, suggestions etc). You will know in pretty far in advance of it, will need to have as many Indy Reds there as possible. Most likely will be at Union Jack unless some other venue or event comes up or sounds better. We are continuing to grow and we see new faces each week at Union Jack for matches which is great. Winter time is always tough for people because of weather and holidays to make it out for matches but your continued support and presence will help us to keep on growing. If we power through the winter(with good results) Once spring hits & Indy Eleven kick off again I’m sure we will see another big surge in people here again soon. 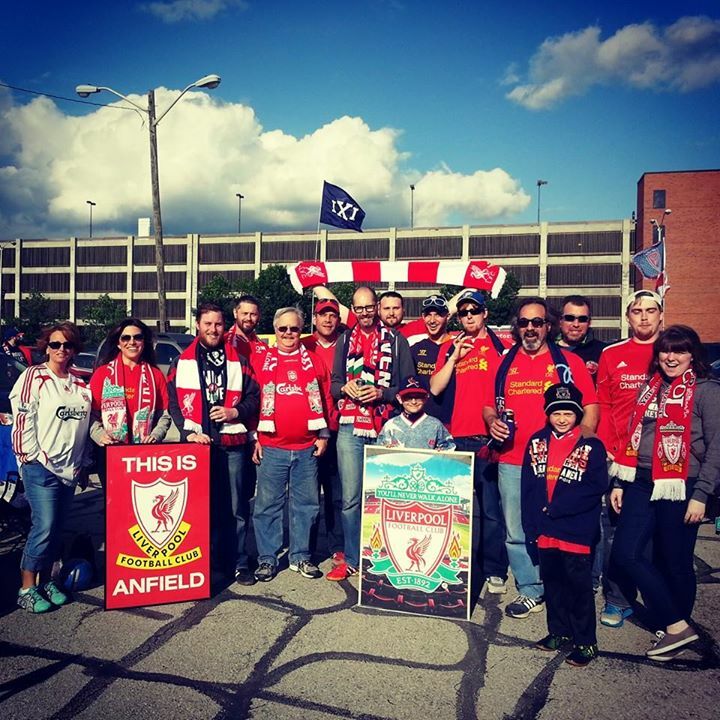 This entry was posted in Indy Red Fan Focus, Uncategorized and tagged Fan Focus, Indianapolis, Indy, Indy Reds, LFC, LFCTV, Liverpool, OLSC, YNWA on December 1, 2014 by LFCIndy.